The Finnish rock chameleon CMX’s rarity tour, ‘Kuljettuja teitä, harvoin kuultuja lauluja,’ must’ve been rather successful a year ago, since the band decided to do another round with the same concept. This time around, in the wake of the release of the new triple compilation, Cloaca Maxima III, there were ten gigs instead of three. 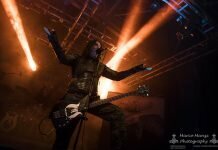 The band dropped by Klubi in Tampere on December 8th, 2016, and like last year, the show was sold out. I didn’t delve into the CMX catalog until last year upon the release of Mesmeria, and I’d only seen them live at Pakkahuone on the tour in support of that album. I missed out on the previous rarity gig at Klubi because I reacted too late when the show was already sold out. This bugged me, to put it mildly, as the setlist looked very nice. However, this time I got to see the show, and once again there was a lot of ear candy in store for the diehard fans. The set roughly alternated between loud and more or less slower songs. I was especially pleased to hear two of my favorites from Pedot (2005): “Mustat siivet yli taivaan” sounded even more dynamic than on the record thanks to Olli-Matti Wahlström’s drumming, and the chaotic title-track was a worthy concert closer. Other standouts included the atmospheric “Jatkuu niinkuin sade”, the beefy “Mestarirakentaja”, “Kuolemaantuomitut”, which was flavored by a piano backing track, and “Parvatin tietäjä”, which was enhanced with cool red lights. Although the audience clearly consisted of diehard fans, the overall atmosphere in the sold-out venue was more pious than raucous, perhaps due to the lack of space. However, a few songs excited the people in the back as well, and the crowd favorites were the shamanistically savage “Pyhiinvaeltaja” and the surprisingly kickass “Ennustaja.” The band seemed to be in their element on the smaller stage, enjoying performing less-than-typical song picks, which could be sensed in the emancipated and relaxed feel. Yrjänä managed to stay in key relatively well, and the band’s playing never sounded plodding, unlike last year when some of the speedier tracks came across as slightly anemic. 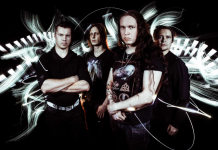 I had no complaints about the sound at Klubi, and the technical side seemed to work on stage as well for the most part – Halmkrona’s guitar pedal played tricks on him a couple of times, but the band handled these issues with humor. As a hopelessly un-punk person who finds Aura (1994) the first truly likable CMX album, I thought there could’ve been less early material in the set. On the other hand, when performed with the professionalism that comes with age and played alongside newer material, songs like “Helvetin hyvä paimen” clicked with me better than they did on the CD. It must be difficult to incorporate harcore-tinged material into so-called normal CMX shows anyway without rousing some degree of confusion (especially when the first two full-lengths and the early EP’s can’t be found on a certain Swedish streaming service), so this was an ideal opportunity to delight the old-school listeners. However, the total lack of Aion (2003) was weird, because as far as I know, it’s a favorite among band members and fans alike. I bet I’m not the only one who would’ve enjoyed “Pirunnyrkki” or “Nahkasiipi.” The new compilation wasn’t strongly represented either, since out of the brand new songs, only the single “Tuulet ja myrskyt” was in the set. It would’ve been interesting to hear some of the previously unreleased B-sides from the third disc – maybe some other time? CMX must be the only long-standing Finnish rock band who can leave out their greatest hits and sing-along tunes and still play to sold-out venues. The old warhorses will certainly return to the repertoire at the summer festivals and on the tour for the next album, but hopefully rarity tours will become a tradition of sorts so that the more obscure songs can get their place in the spotlight in the future as well – after all, the CMX discography is so large that you could compile numerous setlists with zero weak songs.